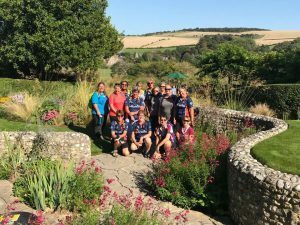 This months Ladies Ride incorporates a lovely long lunch at the Courtyard Cafe, based at the YHA South Downs Hostel at Itford Farm. The ride will be leaving at 11am from the meeting point at the bottom of Edinburgh Road (next to the cycle path where the ice cream van parks), and will aim to return at approximately 4.30pm. It’s unusual for them to be THIS close to the gate! Essential kit, as always, includes: your helmet, a drink, a spare inner tube, pump, lights & lock. This months route will encounter grass, concrete, gravel, tarmac and depending on the weather, mud. Making it suitable for MTB & Hybrids with knobbly tires. Leaving the meeting point, the ride will head into Seaford and towards Seaford Golf Club. 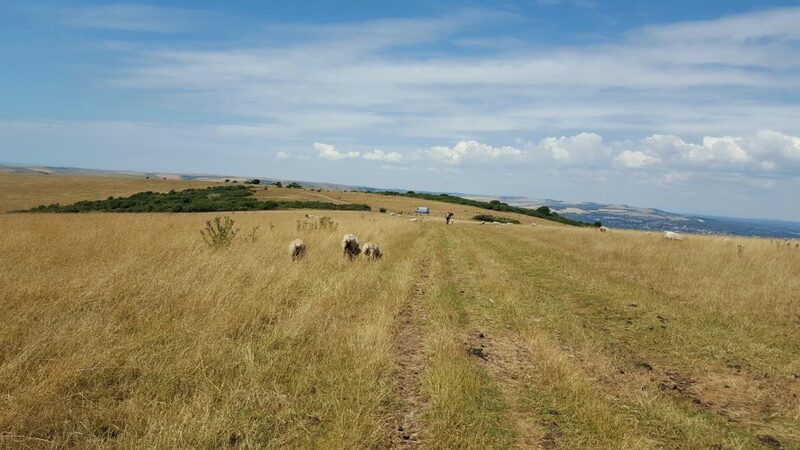 The concrete road will take you up onto the downs where you’ll head towards Bo-Peep and Firle along part of The South Downs Way. Once you’ve reached Firle it’ll all be down hill (almost!) via Itford to the lunch stop. Depending on weather conditions, this could change. The return will be via the much less hilly Egretts Way / Ouse Estury route, which will, as part of the cycle route, take in a short part of the C7. This route is a little more adventurous than the winter routes. Although the ride will always be paced at the speed of the slowest rider, and everyone supports each other, the 217m climb to Firle isn’t for beginners! If you have any concerns about this, contact the Ride Leader Sarah Winser from the Ride Leaders contact page, and she’ll be happy to help and guide. One thing (weather permitting, of course!) guaranteed, are fabulous views from The South Downs Way across the flatlands below to the High Weald in the distance. On a clear day you can see over 40 miles in a 360° panorama from the top. 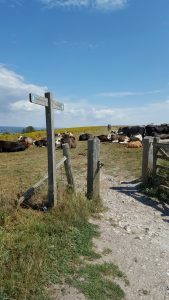 As the ride is on the Downs, there’s every chance that we’ll be sharing our route with other cyclists, pedestrians, horses and dogs, and of course those that live there: cows and sheep. Be prepared for your bike not being perfectly clean on your return! Ladies Ride to Follers Manor. 1st September 2018. 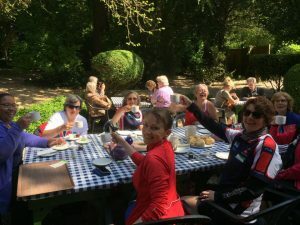 The Ladies Rides go out on the second Saturday of the month and are more of a social affair, than aiming to cover the route in as fast a time as possible! If you’ve just joined, or are thinking of joining the club, then a Ladies Ride could be the perfect way of getting to know others. Sarah is a wonderful ride leader and will put you at your ease from the moment you arrive, or contact her. What’s to loose?! Royal Wedding Ride. 19th May 2018. Your ride sounds great, I’m not sure whether I’m still a member, but am thinking of joining you? I’m getting in touch now though on behalf of the Egrets Way Project. We’re planning an Egrets Way Art Trail as part of LDC Artwave August/Septemebr. Open studios/houses located close to the Egrets Way will be showing arts and crafts and we’re in the process of organising walks and rides along and around the Egrets way using the YHA as a hub – most venues will have tea and cakes and will be great stopping off points for cyclists! I’m hoping that Cycle Lewes will organise a ride or two? We’re printing a leaflet to promote the Egrets Way Art Trail, walks, cycle rides and craft workshops. Rides will also appear in the Artwave brochure and be publicised throughout June and July. Please let me know whether you might be interested?